Does this sound like you - lose weight Monday through Friday and gain it back on the weekend? It's one of the many unfairnesses of weight management. 2 quick days can easily erase a week of best intentions. Well weekends are actually pretty long. 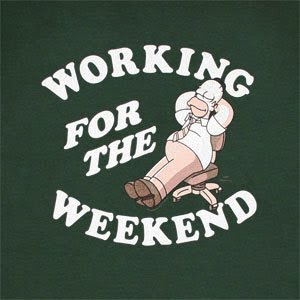 I know, it sure doesn't feel that way but indeed, weekends take up roughly 30% of our weeks. Get disorganized, go out to eat a few times, have a few drinks or simply have a "write-off" and suddenly nearly a third of your week is gone. Worse still, for folks actively trying to lose weight a weekend of indulgences can easily erase 2-3 days of great efforts leaving a person with just a day or two a week to lose. Have life throw a hiccup or two on those days and kiss your week's weight loss goodbye even if the majority of the week you were actually doing great. Weekends need to follow the same rules as the week. Eat every 2-3 hours, be calorie aware and only eat out for celebration. Don't waste your calories eating in a food court because you didn't plan your day's shopping well, or lounge around till 11am only to have a 2,000 calorie brunch just because it's Sunday. If you're serious about weight management your efforts need to occur 7 days of the week where effort means minimizing hunger with well organized meals, snacks and macronutrients and also means knowing what you're eating. It doesn't mean don't indulge, it just means ensure hunger doesn't fuel your indulgences and that you've thought about them to ensure they're actually worth their calories to you. 5 steps forward and 2 steps back when it comes to weekends often translates to 5 steps forward and 5 steps back. Seems a shame to let 28.57% of your week erase the remaining 71.43%.